How exciting for you and your Mom, Bandit! Mom doesn't have any experience with flying with pets or relocating pets. But here is a carrier to check out: The Sleepy Pod Air Cat Weight up to 17.5lb Meets major airline carry-on pet regulations by being able to compress in length from 22" to 19" when one side is compressed, or 16" when both sides are compressed. Expanded 22Ã—10.5Ã—10.5" Compressed 16Ã—10Ã—8" There is a whole page of info in the link above. Hope this can work out for you! Hi Bandit, Just a thought. Are humans allowed to purchase a seat for a small pet in a carrier? I have no idea, but it's worth looking into. Thanks for the advice! After a lot of thought and research, Mommy is going to use a pet relocation service. They have a door to door service and have lots of experience. They seem really nice and will take care of all the paperwork. It is a bit expensive but Mommy said that is why she has no human kids, so that she can spend money on fun things and me. The service only uses certain airlines that are super good with pets. Mommy is going to buy me a crate and then we are going to practice hanging out in it and taking rides. Mommy doesn't think that Canada was a good option and I can't lose 3lbs by the time we go, it would be kind of a lot in a couple of months. I lost 2 pounds in the last 2 years though! I am a big boy. Hey bandit we hope we are not too late to help out! mommy flew with us all the way from Israel to the east side, after much consideration and using a pet relocation service, we decided the safest way to fly her is with the german airline lufthansa. 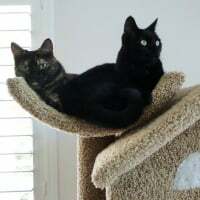 we heard alot of positive reviews about their human and feline services, and they truly were super great; taking care of all of us, and they were super nice to US (Anna and Katie) who had to go in the cabin with mommy, to make sure she is well taken care of. any way we think she was, she seemed to get some really great food choices during the flight and she seemed pretty pleased with the choices. the only down side we had was the layover. but the plus side of it is that during the layover we were being taken care of at the great animal lounge lufthansa has in the airport (we had a stop in frankfurt). 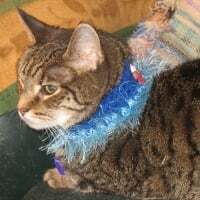 we so recommend thinking of a diet to maybe lose a few pounds (we recommend raw meat diet - Lucky the oldest of us lost 8 pounds in only 4 months after mommy transfered us to raw) an over weight kitty is not a healthy and happy kitty! if despite your mommy wishes you will decide to fly trunk side, there are plenty of great cages, if you can get them we recommend the italian company "ferplast" cages, though we do know they are not common in the US. if it is a pretty short flight than the atlas 40 should be enough, if it is longer than 8 hours than it is best to get the Atlas 50. if not any strong plastic dog carrier will do. and you mustn't forget to put holes and tie with those plastic handcuffs, for extra strength so the cage won't, Isis forbids, open up. if you have any more questions will be happy to help out. Hey everyone! I am going to make a post in my diary, but wanted to let you all know that I arrived safe a sound a couple of weeks ago. It was quite a trip! Mommy got a pet relocation service and I flew with KLM. Everything went well and I am getting used to my new home. Sorry I did not see your post sooner. We used petrelocation.com. I hope your move went well!